Rowing has of course, a long history in the western world since oared vessels have been in use for millenia. “Regatta” originated in Venice as a water festival which, by the early fourteenth century, included boat races. Rowing at Penn is related more specifically to the development of the sport in England, America and Philadelphia. In England oared barges were part of the Lord Mayor’s water processions from 1454 until 1856; regattas as water festivals began to appear in the 1760s and 1770s,. The first documented race occurred in 1715 when Thomas Dogget offered a prize for watermen in a race on the Tideway in London during their first year of apprenticeship; the winners were also eligible to man the Royal Barge on state occasions. The first record of competition between two eight-oared boats was a race between the Chatham and the Invincible on the Thames in 1788. Boys at Eton devised their own procession of boats as early as 1793, and during the next decades both college students and other men began forming boat clubs to pursue the sport. The first Henley Regatta took place in 1839; its race, about a mile and a quarter in length, became an alternative to the four-mile race already common. In America as in England, the developing sport of rowing drew from multiple traditions and classes. Competitive rowing took place in America as early as 1756, when a New York pettiauger defeated a Cape Cod whaleboat in a New York race. New York remained the center of American rowing throughout its early years, perhaps because of the importance of the ferrymen who rowed passengers across the Hudson River. In 1811 two four-oared boats, the Knickerbocker and the Invincible, raced from Harsimus, New Jersey, to the Battery, and in 1823 the Knickerbocker Club became the first boat club organized in the United States. The first U.S. collegiate boat clubs were organized at Yale in 1843 and at Harvard the following year. The first intercollegiate athletic contest in the United States was a race of eight-oared boats from Harvard and Yale on Lake Winnepesaukee in 1852. An intercollegiate regatta between Brown, Harvard, Trinity and Yale boat clubs was planned in 1858, but then cancelled after the drowning of the Yale stroke. In 1871 Amherst, Brown, Bowdoin and Harvard formed the Rowing Association of American Colleges. Rowing matches took place in Philadelphia at least as early as February of 1832 when the American Turf Register and Sporting Magazine reported a race involving nine boats, each rowed by one man. By completing the five mile course more than sixty feet ahead of his nearest competitor, George Bastian won a purse of $20 or a new boat of the same value. The first Philadelphia regatta in 1833 included races between both eight-oared boats and six-oared boats. The following year, crews from Philadelphia boat clubs raced in another regatta. In 1854 students from University of Pennsylvania founded the University Barge Club and joined the other boathouses on the banks of the Schuylkill River. The “Schuylkill Navy,” formed by several boat clubs in 1858, held its first regatta, primarily six-oared boats, in 1859. By the 1870s Philadelphia was emerging as a major American rowing center. Thomas Eakins completed his painting of rower Max Schmitt in 1871, the first of his influential paintings of both amateur and professional rowers. The distinction between these two categories was now becoming an issue in American rowing. Races with cash prizes often involved betting, which sometimes led to violent crowds when races results were disputed. At the Schuykill Navy Regatta of 1872, the amateur status of several oarsman was challenged, leading to debate among American rowers. This uproar led to the formation of the National Association of Amateur Oarsmen (later the United States Rowing Association), the first organization of American amateurs involved in a team sport. Also in 1872, Philadelphia reintroduced eight-oared racing to the United States when three Philadelphia boat clubs purchased eights from the London Rowing Club and raced them in a Thanksgiving regatta on the Schuylkill. Fours racing continued to predominate for some time, however. 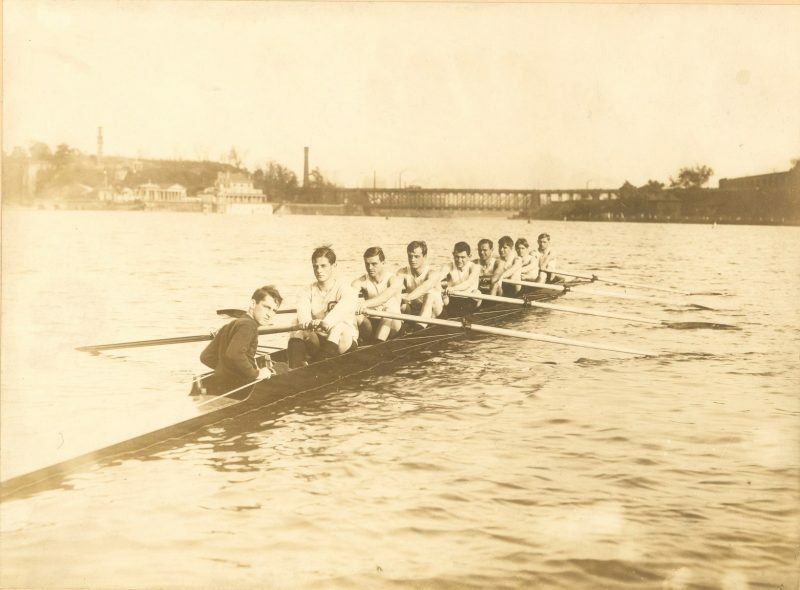 The first Childs Cup races, established in 1879 by Philadelphia publisher George W. Childs, were won by Penn’s four-oared crew; not until 1889 did this regatta switch to eight-oared boats.